A game changer in the market, the much sought after Up Box+ combines affordability with advanced features, making it a world leading educational machine! Print ABS parts up to 255 x 205 x 205mm (10 X 8 X 8 in) inside the fully enclosed chamber with HEPA filtration. iMakr offer a 1 year warranty on the Up Box +. The Up! Box+ is a very capable 3D printer with many advanced features for its price. The print area is very large when compared to the overall size of the machine and the fully enclosed chamber makes it ideal for printing ABS. The enclosed spool size has been increased from the 500g of the Up! Box and WiFi is included on the new machine. The Up! software continues to be improved and is easy to use but also includes more advanced features for confident users. Large Build Volume: TheUP BOX+ provides a build volume of 255 x 205 x 205 mm (10 X 8 X 8 in) for extra large print jobs. Enclosed Printing: The enclosed build chamber maximizes temperature stability and combines with a novel ABS print surface to enhance adhesion, the result is minimum warping even when printing large objects. Quiet Operation and Air Filtration: The UP BOX+ produces very little noise, while the built-in air filter absorbs fumes and minimize odor, making it perfectly compatible with an office or classroom environment. Smart Support Technology: The industry leading support generation algorithm produces easily removable support structures, improving the surface finish of printed objects. Powerful Software: UP software is simple to use, feature rich, fast and free. Its easy enough for rookies and versatile enough for gurus. Advanced Features: Filament run-out detection and power failure print recovery ensure prints finish even when the unexpected happens. Build volume of 255 x 205 x 205 mm for extra large prints. 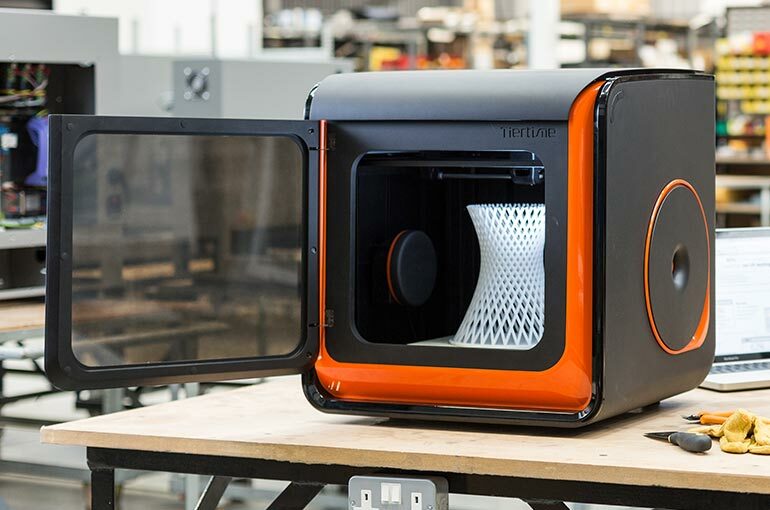 The enclosed build chamber maximizes temperature stability ensuring minimum warping even when printing large objects. Built in air filtration system to reduce noise, absorb fumes and minimize odors. Built in smart support technology allows objects to be printed with removable support structures to improve the surface finish. Material ABS, PLA, Carbon Fiber, PET, ASA and more.